In an essential sense this painting has everything of Whiteley. It is an artistic compendium of his aesthetic attributes, his compositional characteristics and a mirror of his personality. Well, not his personality – that is well known; but rather his inner artistic character. 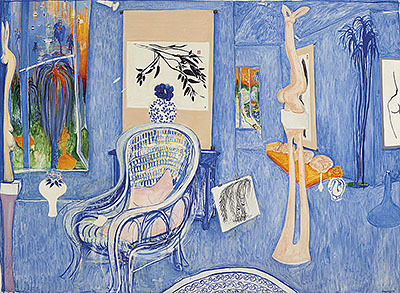 The inscription located to the upper right of the canvas reads ‘interior at Lavender Bay under sunlight - april – may’, and beneath, in the artist’s signature ultramarine blue, are the words ‘astral weeks’. This is the key that opens the door to Whiteley’s state of mind at the time he created this large and significant painting, which incorporates as many as nine images of his own various works. ‘Astral weeks’ – in other words, the two-month period that saw the creation of this distinctly calm and reposed painting – was blissful, and seemed like an alternative state of existence. Correctly speaking, an astral state is based upon the concept of a counterpart self, which exists in a higher realm – this is the realm that Whiteley suggests. For him, it was that highly private place well away from the buzz and brutality of the outside world. It was the realm of his studio-refuge, where he could be himself and go back to the insights and output that made him so justifiably famous. What is being recommended here is not eye candy – just as Debussy and Satie are not muzak. What Matisse is talking about is an art of retinal refinement and optical ease that is, by contrast, well away from Futurist fury and Cubist constructions. His is an art of pure picture plane concerns – harmony, colour, pictorial balance and planar relationships - all of which are treated and used as artistic components of his limpid compositions. Consequently, Matisse’s singular art has distinct stylistic attributes: forms are often outlined, everything is caught in stillness, contours are simplified, colours are applied in thin, diaphanous layers, pictorial depth is shallow, viewpoints are high, light sources are even and shadows are eliminated. The results are light, fresh and airy pictorial tableaux. They almost always radiate what can only be called Mediterranean warmth. These are the attributes Whiteley assimilated, and these are the ways he understood Matisse. The interplay of these factors innervates the interiorised soft mood of his painting My Armchair of 1976. My Armchair of 1976, presents an interior view of part of Whiteley’s Lavender Bay studio-home in Sydney. The studio walls are vaguely suggested with a thinly brushed layer of Tunisian blue pigment that ranges over the canvas without modulation except for the lower right corner. It shows no ceiling and the floor is undefined so that all the pictorial elements in the scene seem to hang ethereally in the shallow blue space of the pictorial scene. There are no shadows to assist in any delineation of pictorial depth and the two open windows, on the far left and centre right of the canvas, blaze rectangles of colour into the monochromatic room. In this shallow space are placed a number of things: the overlarge empty cane armchair of the title, painted with evidence of pentimento, at the left of centre, with evidence of a recent sitter (an indented flesh toned cushion, three thought balloons and an open book); a small chest; three of the artist’s blue and white pots; a blue vase; Whiteley’s deft version of a Japanese picture scroll and two other ink drawings; a charcoal drawing in progress; a yellow telephone; a sofa-bed; a plant; a section of carpet and two of Whiteley’s mangrove wood sculptures in poses that hint of languorous bodies and Matisse’s paper cut-outs. In the upper register are three unpainted Concord spotlights (in the Seventies every ‘hip’ person had Concord spots). Whiteley’s My Armchair of 1976 displays the lightest of touch of any in his Lavender Bay-based Matissean series created between 1974 and 1976. The pictorial ambience is light and airy, with touches of bravura, and seems to echo the sublimely spaced flair of his favourite music – Keith Jarrett’s justly famous ECM recorded Köln Concert, the world’s best-selling solo album in jazz history– which he played constantly when sequestered away capturing the interiorised mood of these sorts of works. The present painting is in fact a rare glimpse into Whiteley’s home life and inner character – a type of exhibition of the self. It constitutes a ‘floating’ display of personal items in a private space with ‘suspended’ qualities and pictorial placements that recall the spatial effects of ‘blue screen’ technology. There are many depictions of artists in their studio, usually grim self-portraits in front of an easel, yet here Whiteley is absent and his presence is sensed rather than seen – like the perfume of a person who has just walked by. The studio interior radiates casual warmth and has the lived-in comfort of favourite slippers. It is a space neither tricked-out like a sales brochure nor tidied up for visitors. In all these aesthetic senses Whiteley’s My Armchair of 1976 is highly reminiscent of Matisse’s major painting Red Studio of 1911 in the collection of the Museum of Modern Art in New York. It shares its ‘empty presence’, its all-over monochromatic ground, its items of identity (including an armchair) and its ‘floating’ casual ambience. It has all this in common with two other equally fine paintings in Whiteley’s Matisse series, namely Henri’s Armchair of 1975 and Self Portrait in the Studio of 1976 – the winner of the Art Gallery of New South Wales’s Archibald Prize for that year. All three of these hallmark paintings of the mid-Seventies show Whiteley using the lessons of Matisse as springboards into the depictions of his own private space. Of the three, My Armchair of 1976 presents the most inclusive viewpoint, the most effervescent mood and the most revealing vignette of the artist at home. I wish to acknowledge the help of Tracy Le Cornu, Senior Art Specialist, Menzies Art Brands and Ingrid Oosterhuis, General Manager, Melbourne, Australian Galleries in the research for this essay.